In 2013, (I said 2003 in the podcast by mistake) my brother in law Martin Aboitiz sat in my dining room and sketched out this business he planned to start. I thought “majnun” which is Arabic for crazy! How would this guy who had built software companies in Argentina found a startup to help Americans have better access to their healthcare data? But I underestimated his resourcefulness and titanic tenacity. Four years later, Healthjump is at cashflow break even and has 7.5 million patients in its data warehouse. I’m glad because I have some real money riding on Martin’s company. Listen to this lighthearted but informative interview. It was inspired, in part, by an excellent meal shared by the interlocutors the night before which included an outstanding paella (see photo) and some delightful wines. We talked healthcare, pivots, angel investing homeruns and flops and many other matters. "I do have a regret though, that I did not mention four names: Juan Manuel Garcia Carral, my CTO in Intermedia who suggested Healthcare as an industry worthy of application and data integration, Dr. Richard Low of PraxisEMR, who first gave me a picture of the lack of data integration in Healthcare Juan Manuel's suggestion, and my two other co-founders in Healthjump, Mark Ribeiro (our original CFO) and Shanti Aboitiz who was our Patient Advocate, both have moved on, but were pivotal in getting Healthjump started." How Did Martin Discover He Wanted to Be an Entrepreneur? Martin Aboitiz’s Advice about Dealing with Failure – Really Good Stuff! SAL DAHER: Welcome to Angel Invest Boston, conversations with Boston's most interesting angel investors and founders. I'm Sal Daher and my goal for this podcast is to learn more about building successful new companies. The best way I can think of doing this is by talking to people who have done it, people such as repeat startup founder and angel investor Martin Aboitiz. Martin, I'm excited you're joining us on our 24th episode. Listeners, a disclosure is in order here. Martin is my brother-in-law. I have the great fortune to be married to one of his sisters. MARTIN ABOITIZ: Thank you Sal. Thanks for having me here. It's an honor, pleasure and always enjoy talking to you and great opportunity here. SAL DAHER: This was proceeded by a night of considerable imbibement, so we had fun last night. Anyway, Martin comes from a family steeped in international entrepreneurship. His father started businesses in three countries. Martin attended the New Hampton school in New Hampshire and then studied civil engineering at MIT with a concentration in water resources. Drawn by an excellent program at the University of Colorado and the mountains of Colorado, you see Martin and his wife are avid hikers and cyclists, he went to Fort Collins for graduate school. His first job was working in water resources in the Philippines. Eventually Martin was drawn back to Argentina to take over one of his father's businesses. He ran the business for nearly a decade under trying economic conditions and was able to make an advantageous sale of the company to a multinational seeking a foothold in the country. Martin then founded one of the first internet service providers in Argentina, which he operated for two decades offering a rich variety of software services to local companies. Along the way Martin started investing in startups through his academic and professional connections. He introduced me to my first investment in a startup. One day in early 2013 I heard Martin talking about this crazy idea he had. He was going to change the way Americans deal with their health records. My first thought was, "majnun!" That's Arabic for crazy. As we all know US healthcare is highly regulated and captive to large incumbents who leave no room for innovation. But when he started explaining his approach and the resources he could bring to bear it started to make sense. I eventually invested in the company mostly because I knew Martin is very smart and unbelievably tenacious and hardworking. Four years later the crazy idea is actually bearing fruit. We'll get into that later. Martin, we like to talk about how people got started in their careers so what drew you out to the Philippines and what did you learn from it? MARTIN ABOITIZ: I was out of MIT and out of Colorado and wanted to change the world. I felt that water had always been the interest and how you deal with water systems and what you could do with it. Then I thought in the big picture how things work and I saw the World Bank attracted me very much by what they were doing in different places and here was an opportunity that just came through connections really, through family connections that led me to knowing that there was this project going on that was World Bank-funded and I thought, "Well this sounds like a good opportunity." So there I was in rural areas in the Philippines looking at the issues of water and erosion. SAL DAHER: What did you learn from the experience? MARTIN ABOITIZ: Well I came fairly disappointed out of that because I saw that it was just so hard to get anything done. Part because of the political system and corruption in various forms, some outright corruption, some is just favors get dealt around. SAL DAHER: And institutional inefficiencies, yeah. MARTIN ABOITIZ: Institutionally and the whole political decision-making process. It's interesting because 30 years later looking at the remains of the project that I was working on, we actually saw some results but from very unexpected ... I don't think we can get into it too much because ... But I see that you don't really understand, you don't really get the outcomes of work that you do. Outcomes take different forms. MARTIN ABOITIZ: Right, but in the short-term I was completely frustrated by what we had gotten done because I thought we hadn't gotten anything done. We had spent a lot of money and I had contributed to the Philippine foreign debt, some of it had gone into my pocket because I was very well-paid. But then years later I saw, "No actually there is an influence." It's patience and doing the right work in the right places, well the outcomes are ... You do see some. SAL DAHER: Patience, having a long-term view. MARTIN ABOITIZ: And a long-term view, yeah. SAL DAHER: But that's good. Now we're going to go to another developing country, Argentina. What are the biggest lessons you learned from a decade of running the family business is a country as tumultuous as Argentina. And especially in a vibrant and moving system like inflation at thousands per cent every day you see the ... I would get up in the morning and look up three or four newspapers, Argentine newspapers in front of me. I spent a couple hours reading the newspaper and then after that I'd make decisions on prices, on what to buy, what to sell and what price, at what price to buy, what price to sell. That was essential to running the business at the time. So that was completely different, I went from 30 year, 50 year long-term things to things that were basically every day. SAL DAHER: Yeah well water resources you're planning 30, 50 years out. MARTIN ABOITIZ: Yeah exactly. That's right. SAL DAHER: This is like 30 days out if you're lucky and it's maybe probably more like 30 minutes. They used to joke in Argentina, which is cheaper for you to take? The bus or the taxi? MARTIN ABOITIZ: That's right, that was a joke at the time. Certainly cheaper to take a taxi. SAL DAHER: Why is that Martin? Why is it cheaper to take the taxi instead of the bus? MARTIN ABOITIZ: Because the taxi, you pay when you get off the bus, you pay when you get on. The time value of money between the time you got on the bus and the time you got off the taxi is paid for, made a big difference in the cost. That was the story. Of course, how you could actually invest that money for the time period of the ride, that wasn't too considered. SAL DAHER: Well nowadays with a good app you could make the investment of the money for 30 minutes when you're stuck in Buenos Ares traffic and get some return on that. But it's a completely different world when you have that kind of inflation. As a further service to young listeners, I like to ask guests how they found their calling. How did you discover that you wanted to be an entrepreneur? MARTIN ABOITIZ: That just came in the blood. My father was an entrepreneur, my grandfather as well and I don't know much. My great grandfather, I go as far back as that. All of them have been entrepreneurs in one way or another. It was the only real understanding that I had, in fact the short amount of time that I worked in the corporate world I was an entrepreneur just as well. I had entrepreneur thinking and when I was working for the Philippine government I looked at things from the eyes of an entrepreneur which is part of the frustration. Entrepreneur decisions are not the same decisions that are made politically. That's where I've been most comfortable. SAL DAHER: What advice would you give someone thinking of becoming an entrepreneur? MARTIN ABOITIZ: There's plenty of different advice and you hear it all the time but the one piece of advice that I think is fundamental for an entrepreneur is to be prepared for the worst. We can all deal with success, we can all figure that out. But we have to be prepared for failure and entrepreneurship will always have failure. You have to understand, "Well what is the worst outcome that I can predict?" Be ready to accept that worst outcome, yourself, your family and be able to accept that if you can't do that then you can't be an entrepreneur because it's a possible outcome. In fact it's more likely that you fail than that you will succeed. There's nothing wrong in failing but you have to be prepared. You can't mortgage your house, though I have seen friends that have done it. Mortgaging your house in order to fund your business is not a good idea. Running your business off your credit card which is going to lead you to personal bankruptcy is probably not a good idea either. I don't say you're not to do it and it's been done and actually I take off my hat to say ... But whoever did that I think understood also the loss, the possibility and was willing to deal with it. Okay, so if I need to go bankrupt now if you don't understand it, if you haven't looked at what will happen in the worst outcome then don't do it. SAL DAHER: This brings to mind Elon Musk's attitude towards investing. He doesn't believe at all in taking your advice, he thinks you should be all in up to your neck in alligators in your investment because that's how you're really going to make it work. The money that he made from PayPal, he blew it and he had to raise additional money to get his projects off the ground. MARTIN ABOITIZ: Fair enough, I mean you can do it. I'm not saying that you shouldn't do that. I'm just saying that you're put in a what-if scenario, okay. If all that goes to bust will I survive or am I going to take a gun and shoot myself? If no I won't survive. People do survive and you will survive but you have to personally survive just as much as just financially or physically. You have to be able to accept. I've had my times in my life where I wasn't prepared, I wasn't accepting. I wasn't accepting failure. SAL DAHER: But go into it with your eyes open to the very real possibility of failure, stare that failure in the face, see what the worst outcomes could be and make sure that you can deal with it. SAL DAHER: That's really good. So, Martin, tell us about the opportunity you're pursuing with your first startup, Intermedia. MARTIN ABOITIZ: We saw the internet coming and I was one of the first ... Certainly my whole circle of friends, anybody they talked to I would talk to people. "Look, the internet is coming," and people would look at me like, "What is this?" I may not had MIT friends. MARTIN ABOITIZ: I had exited, yeah. I had exited the family potato chip business in Argentina, we had sold that. I had already done my first venture investment, Exos, which you and I shared. SAL DAHER: We'll talk about that later. SAL DAHER: The telcos is telecommunication companies. Phone companies and so on. We sold that. We couldn't compete in our scale for purely the connectivity of the internet and the ISP side of it. We sold our client base to a telco and we kept the consulting services and hosting and software development for businesses and we did that for quite a number of years. On the whole mediumly successful, none of it was a home run but it worked. It was mostly an interesting business. SAL DAHER: You covered your costs and got your money back. MARTIN ABOITIZ: We did well enough and then at the same time we did what is today called incubation, we didn't ... Because we would spring in interesting ideas and building up at our cost and put that as investment into ... We saw a number of companies come through us, all of them failed. All of the companies that we work with that we incubated failed and that cost us a fair bit to recover from that. It wasn't our business, it was somebody else's business. We had some interesting ideas but they all failed. Our corporate services worked well and that grew and that's what eventually ... The company was sold in two pieces. It was first sold as an ISP service provider and eventually it was sold as a consulting and hosting services company. At some point I realized I didn't want to build out somebody's service, that really I wanted my own product and I wanted a product based on the technologies that we were running. That's how I fell upon healthcare. SAL DAHER: This leads up to the next question which is early 2013 I remember we were having a nice sit down, wine, beer and so forth at our place in Cambridge. You came up with this majnun idea, mjinga in Swahili. Tell the story of what you wanted to achieve on the second startup and what you achieved and so forth. First let's mention the name of the startup. The listeners will be able to see the logo on his t-shirt, on Martin's t-shirt on the podcast website when I put the pictures up. SAL DAHER: Yes, Healthjump, yay. MARTIN ABOITIZ: Healthjump is a great company. SAL DAHER: Corks are popping. MARTIN ABOITIZ: Yeah. We fell into Healthjump not ... I wasn't specifically thinking of doing something for healthcare, I was saying ... We had an understanding of the architecture of how software services get integrated and data moves across different services. SAL DAHER: This is from your previous business? SAL DAHER: An amalgam, yep. MARTIN ABOITIZ: Yeah. So we had built this case-by-case basis for specific requirements of different ... I said, "Well there's a product here." And say, "What industry should we go into?" I was sitting with my CTO in Argentina and looked thinking, "Well what industry should we go into?" Andre says, "Well you know we could think of travel." "Yeah we could think of travel, so what would you think?" "So how about agriculture, perhaps there is an opportunity in agriculture." So we went through industries and then he says, "Healthcare. What do we know of healthcare?" That was the one thing that we know least of, we know nothing of healthcare. Then it came to me, "Ah, yeah I know somebody who knows." That's the key, talking to somebody who knows, who understands a problem. I went to talk to this fellow and I asked him, "Well how does healthcare data move around and how do different applications get integrated?" And realized that no, it does not happen. Healthcare is frozen, is sitting in silos. MARTIN ABOITIZ: Healthcare data is sitting in silos, is not going anywhere and people don't have access to it, individuals don't have access to the data. Doctors only have access to the data which they generate but they don't have much access to data that's generated by other doctors which is so this care continuum of how data goes between the specialists and how it goes to your lab or from the lab or data from physical therapy. How does a physical therapy office know what it is that you need to address and so forth. So how does data move around in healthcare? We realized it doesn't. So when we saw that it doesn't we said, "Well here's an opportunity." It was right there, it only took five or ten minutes to realize, "Okay this is the opportunity I want to work to." It fit a little bit with the issue that, "Okay this is a large-scale problem, this is a problem that is all over the world and if we do have an effect on it we'll have an effect, we'll have a worldwide effect." SAL DAHER: You'd never done business in the US. MARTIN ABOITIZ: I'd never done business, very little. We had a few customers that were in the US from companies in Argentina but it was few and that hadn't been terribly successful either. SAL DAHER: What was the original conception of the company and then walk me through the pivot that you did. SAL DAHER: So, it's very prickly, moving data then. MARTIN ABOITIZ: So, it's difficult issue how to find value in the actual movement of data. What we felt was the biggest value and to this day I still believe it's the biggest value is for the patient to have access and control of their healthcare data. SAL DAHER: Okay so it's to empower the patient. MARTIN ABOITIZ: Empower the patient actually by giving him access to the data and control and to be the patient mediated health exchange. Health exchanges are these organizations which aid in the movement in exchanging data between different health systems. In the patient mediator exchange model it's the patient that controls, the patient knows what doctors the patient has visited and the patient connects to each one of the doctors and gets access to the data and then passes that data on to another doctor when he sees and visits another doctor and so forth. We felt the patient control the data was the fundamental problem to address and the solution, and in fact there is still the government mandate for doctors to do this, to give patients access. We built the product that ... The original Healthjump product that was designed to fill the government mandate. MARTIN ABOITIZ: Yeah. 5% in the original Meaningful Use requirement 5% of your patients had to exchange messages and records between the doctor and the patient. We would fulfill that role and we felt that the patient was going to be the driver and would address the problem of how you regulate the right to access because the patient has all the rights and the patient can ask any doctor and force any doctor to get the data that is required. MARTIN ABOITIZ: Right. By virtue of the patient having access to a full set of records then any doctor serving that patient would also have access to all this data, yeah. SAL DAHER: So, in an emergency the doctor could just look up all the information immediately and not have the situation which still operates on faxes. It's unbelievable that they're still using faxes in this day and age. But my understanding is that you couldn't figure out how to make money at that business, it didn't grow fast enough. MARTIN ABOITIZ: Exactly. It turned out that the Meaningful Use requirement got reduced and what used to be 5% which was significant, it was reduced to nothing. There was no longer a 5% requirement, only the capability. You have to have the capability to make the connection to the patient. But if that capability was used or not was not important. SAL DAHER: So, you couldn't drive adoption of your software by the patients? MARTIN ABOITIZ: Right. So the government mandate was not driving adoption. It really was not going to ... It was going to take a very long time. But then we found another niche in the requirement of moving data and this is the issue that you've got all these applications that are being deployed today for analytics, for predictive analytics, for reporting data, for continuity of care, for population health and then the whole movement into Accountable Care Organizations and their movement into patient-centered medical homes and all of these, all of this software requires access to data. They each one of them had the same problems that we had already addressed. SAL DAHER: Coming from the work you've been doing in Intermedia of having one application talk to another, creating connections between applications you were then recreating that same thing in the higher level here and making it possible for all these various applications that are used in the medical record space to use the data that's in the electronic medical record systems that the doctors have in their offices. MARTIN ABOITIZ: Saber. Both of those companies, what they do is they're a broker of data basically. They're a little different because really mostly what they do is they broker the transaction data of reservations. SAL DAHER: Yes, Saber and Amadeus are airline reservation systems. MARTIN ABOITIZ: Tours and any travel service. This is what makes it possible today for there being an industry in which a small player like a bed and breakfast across the street can work as an independent entity and next to it across the street they might have the Hyatt, the same traveler might actually use both on the same trip plus different airlines plus the number. Now in healthcare it's different because what we're seeing right now is the equivalent of the Hyatt across the street buying the bed and breakfast. That did not happen in travel but it's happening in healthcare. SAL DAHER: It's not sustainable. MARTIN ABOITIZ: The hospital system is buying a one-doctor practice, a three-doctor practice and this is completely different to how you run a hospital to how you run a one-doctor practice or a ten-doctor practice, three different problems…because data doesn't flow. The reason why the single doctor practice is now being forced to sell is because they are sitting on their own data and the health system sits on their own data and there is no over-arching application that joins those two systems. So, the only thing that the doctor can do is sell itself to the health system. Mostly hospitals that are buying up practices. Over the whole system you implement a single monolithic application, typically Epic but you got Cerner and you've got others but Epic is today the one that's taking all the new implementations. SAL DAHER: Bed and breakfast. MARTIN ABOITIZ: Bed and breakfast is going to run and that's not how it works. This is how we see it, we see a world in which this whole conglomeration of services is not going to succeed to the great extent. SAL DAHER: The concentration of services in large players, you need large players and you need small players. Your technology is enabling the smaller players to continue to operate more efficiently, to extract from the data that they have the information that they need in order to operate effectively in the new environment. This is the niche that you discovered. You still have a hope of having patients control, really take pride and interest in their health data and that's coming along, we can talk a little bit about that. But the most important thing that's happening right now is that you're helping dozens and dozens of medical systems communicate between the applications they have in-house and to a data warehouse. MARTIN ABOITIZ: For the doctor's practice. Just purely under schedule. That requires an integration of a number of different pieces of software and has an access into the scheduling system of the doctor. And so, we address that and so now Everseed can sell typically what's happening is that applications are being built, even third-party applications are being built to one single EHRs, a single electronic health record software system. They're sold like partners in partner agreements, bolt on. You bolt on an analytics package on top of data that's sitting in a single electronic health record system. But then we go to that company, say, "Okay, what you're now doing for Athena you can now do it for NextGen, or you can do it for anybody else." We connect to some 20, 30 different pieces of software so it's possible for a software provider to now sell services to implementations of all this. SAL DAHER: You're enabling software providers to integrate more deeply with existing arrangements through the software that you provide, that the Healthjump provides. Are you at liberty to disclose the number of healthcare records that you have in your warehouse? MARTIN ABOITIZ: Yeah sure. We are now addressing data for about seven and a half million individual patients for whom we have the records in our warehouse. MARTIN ABOITIZ: Right. Every time one of these patients visits one of the doctors who are our customers the data goes ... His/her patient data is at the customer and with us as well. Then the customer itself uses, we have a business associate agreement but which is what allows us to have this data so it's all HIPPA-compliant. Now this health system can now apply software tools on top of the data that's in our warehouse that it could not apply to the original database because there were many multiple databases and you couldn't apply it to all of them at the same time. SAL DAHER: You're monetizing your business by providing the practices and various medical systems, the ability to understand the data that they have and they're paying you for that. And you still have the dream that as the number of patients who are in your data warehouse grows the patients will start becoming more interested in their health data and they'll start using it for various purposes. MARTIN ABOITIZ: Yeah. We have about 40,000 patients who actually have access, of the seven million 40,000 are actually accessing the records. This is because a doctor has encouraged them to. The doctors of the seven million patients could also tell their patients, "Go see your data in Healthjump" and the patients could do so. But they don't, they have no interest. SAL DAHER: So that's the challenge moving forward. MARTIN ABOITIZ: In the longer-term we see a world where as a patient once we have a large enough proportion of the patients in the US if the patient shows up and signs up for Healthjump, I mean you can do it today. You can download Healthjump, you can download the app or connect over the web and connect to your records and connect to your doctors. There is a small chance that one of those doctors is already a Healthjump customer because of they're using it for analytics or for some other purpose and then the data's available. SAL DAHER: But three years down the road it might be that if someone downloads the app the much greater chance that their doctor is in the system, so then it has a lot more value. There's a network effect on this and so it's like a flywheel that's gaining speed and eventually it's really going to be a powerful engine. MARTIN ABOITIZ: We really haven't worked on the patient side very much, we keep it updated, it's still running. There's a lot that we can do to the patient application but since nobody pays us to do it or very few people pay us to do it then the Healthjump experience is quite good. It's still very good but it's not as good as we would hope. Once we have a larger number of patients connected then we can ... And we have a better revenue stream to keep that part of the business running. Right now we've de-emphasized if the company looks like a pivot it's because ... It looks like it's done a major pivot because before we were a patient company and now we are providers of a service not even so much directly to practices, our customers are mostly software companies. We sell to software companies. SAL DAHER: So, you're middleware. MARTIN ABOITIZ: Yeah, so we're middleware. SAL DAHER: One thing as an investor I can tell you, I'm really gratified. I understand you guys cash flow break even. You've managed to basically get this thing off the ground which is a tremendous thing. Coming up next I will ask repeat tech founder Martin Aboitiz how he built the team necessary to launch his second startup, Healthjump. First, I want to thank listener Joan D for this review. Angel Invest Boston has guests that inspire me almost without fail. These are women and men who have built startups either as startups either as founders, angels or executives and have much to say. I appreciate that Sal stays out of the way and lets them talk, yet Sal is no wallflower. Great listen." Thanks, some of these reviews are funny. Thanks Joan D. I'm wondering if perhaps she wants me to stay out of the way more. Thanks Joan D for doing your bit and leaving a review. Actually, being a podcast host, a lot of it is just staying out of the way and letting your guest talk. 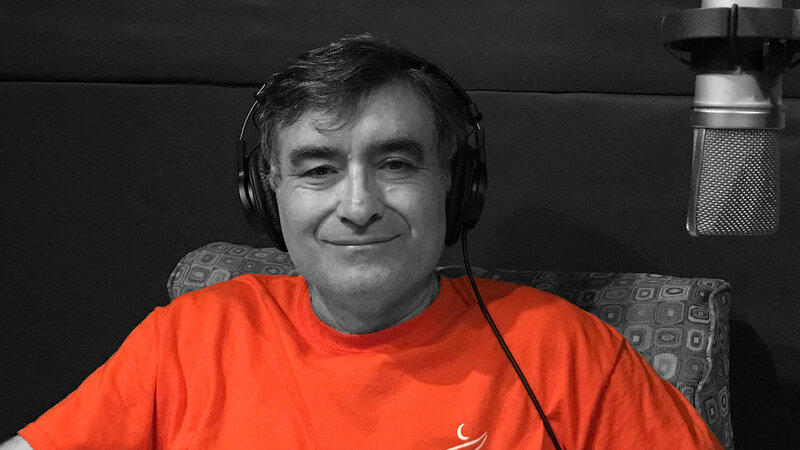 Angel Invest Boston has really outstanding guests such as Martin Aboitiz, it's professionally produced so you get really great sound, has no commercials and comes to you free. The only thing we ask in return is that you help get the word out. Please, tell a potential angel or founder about us, take a minute to review our podcast on iTunes, sign up at AngelinvestBoston.com to be notified of new episodes and of upcoming in-person free events. Martin, how did you build the team needed to achieve Healthjump's really ambitious goal of changing how Americans deal with their medical records? SAL DAHER: Yeah, APIs are everywhere. MARTIN ABOITIZ: Google Maps or any of those. He posed the question and I said, "Oh this fellow knows what he's talking about." So I grabbed him and the way I see that Cliff Cavanaugh, our CTO. So I grabbed him and we sat down and I started discussing the problem of medical records and how they moved around and I saw it in five minutes, okay there was an opportunity to build something. He had very clear ideas as to how a product would be built. Cliff had been in the healthcare business for ten years so he had what I didn't have. Cliff and I, right at that moment we had saw, "So okay, we're completely complimentary." He said, "Yeah, but I'm going to need some money for this." "How much money do you think you're going to need?" "Well to build the first product I think I need maybe $300,000." I said, "Okay." That's my job, I said, "That's my job." That's how it went. I had Cliff and then soon enough I met Cliff's partner, Jim Roland, who was a sales guy. SAL DAHER: So, you had an understanding of the problem, they had a lot of experience with nitty gritty integrating various health record systems. MARTIN ABOITIZ: Right, their company was called Data Trade Solutions and mostly what they had been doing was data migrations. Whenever a health system changed their EHR they were taking money from one EHR and moving it into another. Which is what gave them exposure to multiple EHRs. We started Healthjump as a separate company which would contract services from data trade and also from my original company Inter Media, of course I still had Intermedia at the time so some services were also provided by Intermedia including the design of the logo of Healthjump in its day. That as it turned out, Intermedia did not become terribly valuable for Healthjump. I was sitting in Argentina and I moved to the US so I sold Intermedia and helped John then on another round around the funding acquired data trade solutions. That's how we brought this team that we're ... It was an outsourced development team, we brought it in-house. MARTIN ABOITIZ: And Jim Roland. SAL DAHER: And Jim Roland. SAL DAHER: I need to mention here that this is not a solicitation. The only people who might be able to invest in a company like this at this point are venture capital firms, this is not a general solicitation for investors. Nobody should get any ideas about what he's doing. This is strictly informative, there is no memorandum or anything like that about a raise. This is maybe in the future. The future of every startup that's succeeding there's a Series A raise. Martin, I want to jump forward now to your angel investing. Please tell the story of how you made your first investment as an angel. SAL DAHER: Well you brought me into it. MARTIN ABOITIZ: I didn't know that you and I, we rescued the company. SAL DAHER: When we went in? MARTIN ABOITIZ: As it turns out the round of investment which I led at the time and brought in a few other people and so forth if we had not come in the previous investors were going to throw in the towel. SAL DAHER: And she talked to Metcalfe about the problems she was having and he said, "Why don't you pivot this? Why don't you do something? Why don't you talk to my friend, Pierluigi Zappacosta. Because she was thinking of doing a mouse force feedback mouse. Is there a force feedback mouse? Pierluigi Zappacosta at Logitech. This is the connection that he made for us. He made our investment, getting a return on our investment possible. MARTIN ABOITIZ: Our investment had failed frankly and the previous investors had been right to throw in the towel. We didn't know this and so we went in and said, "Okay, there's some nice product and good team and so forth. So we invested and then two years later this company was dead. I say, "Okay, that was my first investment in DC as an angel investor and that was that. MARTIN ABOITIZ: Yeah, every product was dead. Then all of a sudden, boom, in my house in Buenos Aires shows up a beautiful document that I still keep. It was the purchase agreement of Microsoft. MARTIN ABOITIZ: Microsoft buying Exos. What happened was I had been hearing of the force feedback thing and because they still had contracts for robotics control with NASA. SAL DAHER: Force feedback mouse or controller? MARTIN ABOITIZ: They had built the force feedback arm for NASA. So that was part of where the technology had come from. Then they got ... Well it's a long story how it actually got there but here it was, one day I see from my personal view because I wasn't involved in any of that, I just heard some of it but I figured, "Okay the company's dead." Here was this beautiful contract and when I started reading the contract I realized the implication that I had just made a lot of money. And so okay, this is great, I love this right? Something that I had thought had failed, I hadn't invested my ... I hadn't mortgaged my house to Exos so this day I had them. But here was boom, all pop. MARTIN ABOITIZ: Then I invested in a telco in a little startup telco that then eventually gets old. Now that company's owned by Carlo Slim of Telmex right? MARTIN ABOITIZ: That company also in fairly short order, in about a year or two, it just turned around and here was an angel investment and came out and boom, I had made nice money. Not as nice as Exos but I had done well. It just, "Oh, okay." SAL DAHER: This is not a typical experience I can tell you. MARTIN ABOITIZ: Right. Then at that point I thought, "Well I'm pretty good at this right? I invested in two companies, the first two angel companies that I invest in. Both of them turn out and so this is good, I can do this. And then I hit onto Michael Mark's favorite Netegrity. SAL DAHER: That must have confirmed your suspicions. SAL DAHER: For five years on the NASDAQ. MARTIN ABOITIZ: The NASDAQ, it was so I said, "Okay, I could do this all day, right? MARTIN ABOITIZ: Then I got my head served on a platter many times, many times. SAL DAHER: Did you get over-confident? MARTIN ABOITIZ: Yeah, many times to the point of ... I don't keep track of ... I don't think if any of us, we angel investors really keep track. SAL DAHER: If you did you might stop doing it! Martin, what's your favorite pivot story? SAL DAHER: The high range component of the speaker, yeah. MARTIN ABOITIZ: There was a music service, it was a music service which had raised some money because there were some interesting people behind it and they had been able to raise good money and they were developing a music service which was before iTunes had been deployed. The story is that they went into Apple and they presented the service for Apple to help them and to say ... And Apple received them and they had a very long meeting in which they explained the whole ins and outs of their music service and everybody thought the meeting had gone very well. Then a month later Apple announces iTunes and so they don't know to what extent any of their ideas, because it was pretty quick. Evidently they had been working or something similar. MARTIN ABOITIZ: Yeah. In any case they woke up to find they didn't have a business and that Apple was not returning their calls, there was nothing that Twitter could do to get themselves into the iTunes business and they were dead. But they still had money, they hadn't spent it yet and they hadn't launched the product. Somehow because they were a number of engineers working on this and they were communicating they had developed for internal communication, they had built around text messaging communication that was internal communication between the engineers. They had something there. SAL DAHER: You mean Twitter could have been Slack? SAL DAHER: It could have been Slack instead of being this thing that nobody knows exactly what it does still, yeah. MARTIN ABOITIZ: Right, exactly. And somehow the long story that then how that came off this fellow, Evan Shaun that tells the story, he's now in Uruguay. He runs an incubator in Uruguay. He left soon after that so he didn't see this story but this is how Twitter is completely different. SAL DAHER: That's really interesting. Martin, we're running a little out of time now so I just want to ask two quick questions. First question, you and I know some really outstanding founders from Argentina. What will it take for Argentina to become a good place for starting a tech company? MARTIN ABOITIZ: Argentina is a great place to build a tech company but only as long as your customers are not in Argentina or only a very small portion of your customers. Argentina has had great successes but these have all been where Argentina has been the development house for the service and then the service has been deployed ... Alec Oxenford, he developed basically a second hand like an eBay kind of but not really an eBay, different. It's more like a Craigslist kind of paid service called OLX in India. He built a company in India, then in Turkey and some other places then he sold the whole thing. But for startups to work in Argentina the product needs to be that is international. SAL DAHER: Because the internal market's small and complicated? MARTIN ABOITIZ: It's a very complicated business environment in Argentina yes. SAL DAHER: 30 something million people, still unbelievably chaotic, yeah. Things are getting better, promising but still a lot of problems. Let's see, make this the last question. Any startups other than Healthjump that you admire? SAL DAHER: Tell us briefly about what Mercado Libre does and what you like about it. SAL DAHER: Yeah, the expression is base camp and summit strategy. You need a strategy for getting to the base camp and a strategy for getting to the summit of the mountain, yeah. MARTIN ABOITIZ: Yeah and most of us, we have the summit strategy. SAL DAHER: But it's the base camp strategy that trips you up. SAL DAHER: Okay, excellent. Martin, I'm tremendously grateful to you for participating and helping make this a great podcast. MARTIN ABOITIZ: Thank you, thank you Sal… very enjoyable. SAL DAHER: Great fun. It was a great time last night, we had a great paella and wonderful wines and so forth. We even had a wine from Lebanon. I'd like to invite our listeners who enjoy this podcast to review it on iTunes. This is Angel Invest Boston, conversations with Boston's most interesting angels and founders. I'm Sal Daher. I'm glad you were able to join us. Our engineer is Raul Rosa, our theme was composed by John McKusick, our graphic design is by Katharine Woodman-Maynard. Our host is coached by Grace Daher.